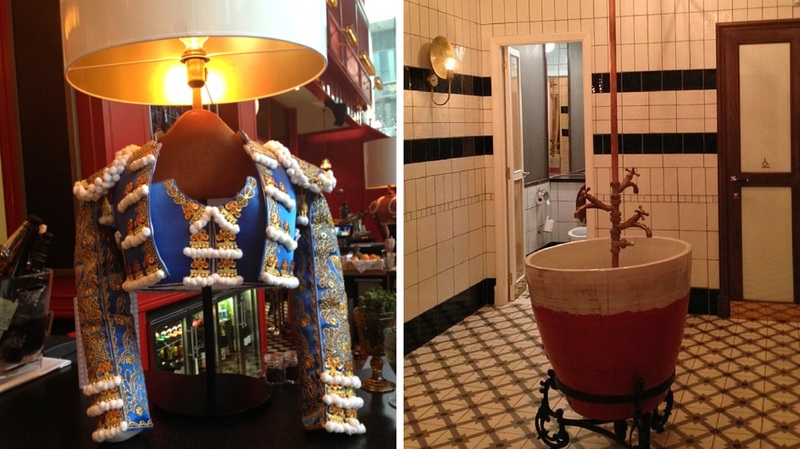 I’ve visited Iberica in Manchester’s Spinningfields twice already. The first time was a week after opening with a group of friends and the second was a wet and windy restaurant in April. Both times, I’ve been blown away. The majority of the menu is tapas, although there are some dishes you can order as a main course. But for me it is tapas all the way because I’m greedy and want to try as much as possible. The joy of going in a group the first time is that we got to try a lot of dishes! Every single dish was delicious. Over two visits I’ve already tried about 17 different tapas and there hasn’t been one I didn’t enjoy. The chefs are taking simple, quality ingredients and creating beautiful Spanish dishes. It’s no surprise that the Executive Head Chef of the group has three Michelin stars to his name. So let’s start with my star dish of both visits- something which really surprised me. 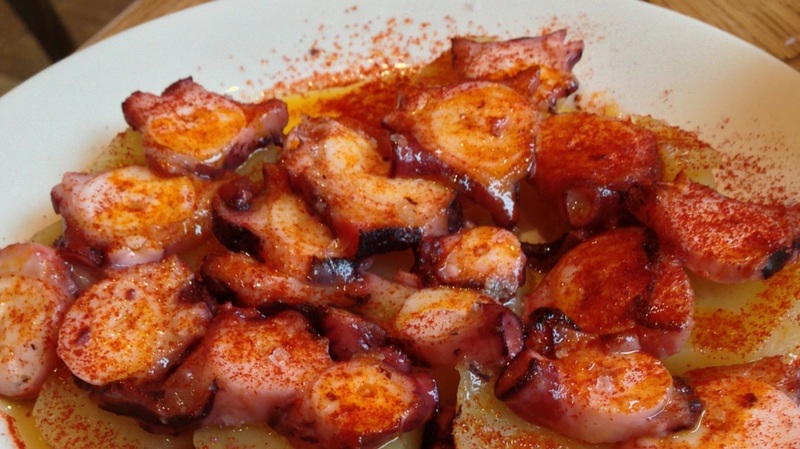 Octopus a la gallega is thinly sliced octopus served on sliced potatoes, sprinkled with paprika and olive oil. The octopus was melt in the mouth tender- I’ve never had octopus cooked so well. Four simple ingredients but together they create a flavour bomb. 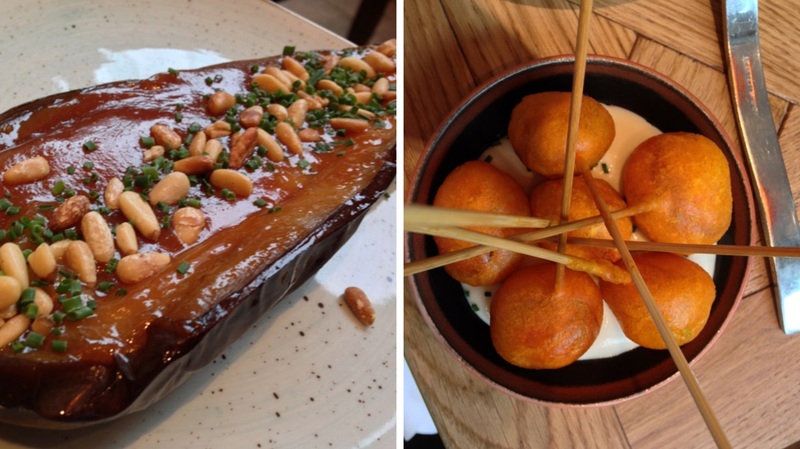 The veggie dishes include aubergine, honey and pine nuts and spring onion tempura with little pots of soy and aioli. Both stunning. Fried chorizo lollipops with pear aioli (couldn’t taste any pear in there but this is top aioli none the less) is such a fun looking dish. The chorizo isn’t greasy even after frying and the crispy outside gives way to perfectly spiced sausage. 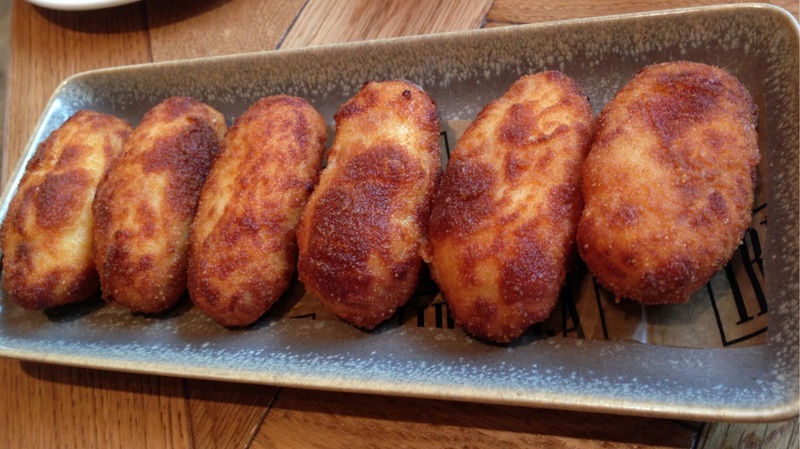 A dish of perfect comfort food came in the shape of Serrano ham croquettes. Filled with volcanic hot cheese and Serrano ham, these are the Spanish equivalent of mac and cheese or hot and sour soup; an edible hug. 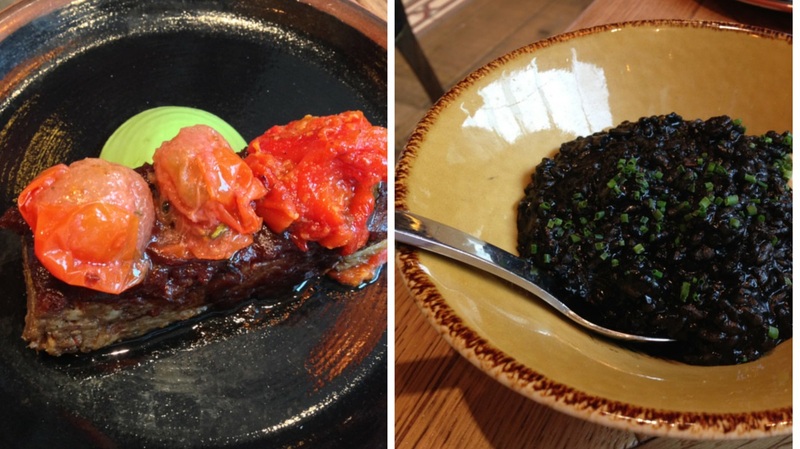 The texture of black rice with squid and prawns made one friend comment that it was like black pudding. When we ordered this dish, both times, we were told it would come later in the meal, I guess as the rice is cooked to order. The only downside to that is that it is a pretty filling dish so by the time it comes, everything else has been served and we were getting full so we left some which is a crying shame. I don’t think I’ve ever cooked anything twice but am glad that someone does. The twice cooked lamb with red peppers and marinated tomatoes didn’t need a knife; it just fell apart when we showed it a fork. I could go on all day about the food but I think you get the picture. The restaurant itself is big – this seems to be a bit of a trend with new openings in Manchester at the moment- over two floors and an optimistic (this is Manchester) outdoor area. The walls are a deep red with Spanish prints on them, lots of different lighting (including some matador themed lamps on the bar which I want!) and seating ranging from high bar tables (I never sit here- my short legs struggle to get up!) to cosy booths. And the loos are lovely with bi-fold doors and a feature sink in the downstairs ones. Staff were great – including a very charming Spanish guy who served us downstairs on Sunday. As with everywhere in Manchester these days, there is an array of gins and cocktails on offer, but if beer is your drink then you only have Mahou. I’ve one gripe and that is that the drinks menu has no non-alcoholic drinks on it, and when enquiring the choice was pretty limited. Some quality non alcoholic choices, listed on the menu, would be my only request for improvement. There’s so much more I want to try – the array of hams for one, and a suckling pig with a group of family or friends for another. I think that Iberica will become something of a lunchtime favourite for trips to Manchester and I look forward to getting back there soon.